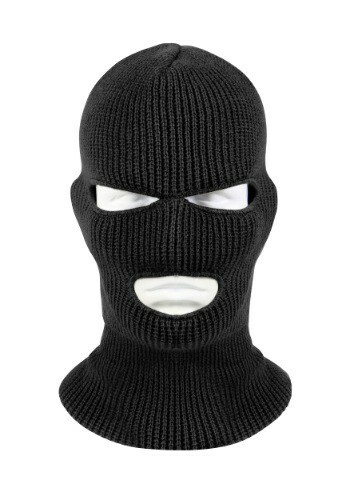 We always wonder how the guy who invented the ski mask feels about what his creation has become. He was probably a ski enthusiast who loved to knit in his spare time. One day he got a little sick of the wind whipping at his entire face, and decided to do something about it. Hard at work that night he knit together a wonderful device that covers as much of your face as possible so you can stay warm, and on the slopes for longer periods of time. Then people realized that they could use it to rob banks and various bad guy stuff. But we know what you're looking into this for, right? You just want a nice, cozy hat to keep your face warm in the dead of winter, right? Well this knit face mask is perfect for that. We suppose it would also be perfect for scaring the tar out of your family in the middle of the night too. That's not illegal either. Just don't give anyone heart attacks. Need a prop for added thrill? We have a fake crowbar that would be perfect!